The original aia 737-300 released in December of 2002 was groundbreaking for it's time, but as the years passed it became more and more dated as newer and better AI models were released from various designers. The framerate performance of the original aia 737-300, which in 2002 was far superior to the framerate performance of other 733 models, is by today's standards, a veritable framerate sinkhole. It was also a nightmare for painters because the fuselage and vertical tail were different scales on the texture. The paintkit, while good for 2002, is very crude compared to more recent paintkits. 3rd parties have since made "enhanced" paintkits for the aia 737-300, which while for the most part were a step forward compared to the original paintkit, also introduced some errors which weren't present in the original paintkit, such as making both forward doors the same size. The modeling of the original 737-300 was awkward as well, especially around the cockpit windows and nose area. The more recent aia 737NG's are much improved in this area. So, what to do? Build a new model from scratch? That's crazy talk. Originally, the plan was to do a simple update of the original model by grafting the better looking nose section of the 737NG on to the old fuselage and adding a few more LOD models. There was one major problem with this plan though. Unlike any of the other aia 737's, the 737-300 had modeled cockpit window framing, which not only ran the poly count up, it didn't look as good as the subsequent 737's which had a painted window frame. Also, since the original 737-300 texture didn't have a texture for the cockpit windows and framing, that would become an issue with the grafted on nose which would need to have that texture. It would have been possible to have worked around this issue by adding a new 256x256 texture that would have the cockpit windows on it, but it was an awkward solution at best and no one was fond of the idea of adding an additional texture. 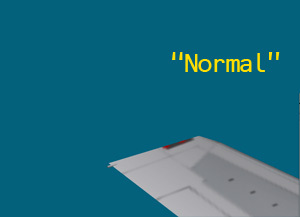 The next plan was to make a "new" 737-300 model by taking the NG fuselage, and adding wings, engines and other parts from the original 737-300 model. Unfortunately, what was good modeling in 2002, doesn't stand up very well 5 years later, so that plan went in the rubbish bin. The final plan was to start with the 737NG fuselage, and rebuild everything else from scratch, which is what ultimately happened. The only parts from the 737NG which are present in this 737-300v2 model are the main fuselage and nose section, and the landing gear parts, but even the gear parts were re-sized. Everything else, wings, engines, tail surfaces, is new. Some of the 737NG fuselage textures remained, but even they were heavily modified, all other parts were repainted from the ground up. Along the way we added a couple of new features that most people won't even notice. So, what's new with the 737-300v2? Faster computers have made it possible to use higher poly counts than would have been possible 5 years ago, so there are more details such as gear parts, antennas, beacons and drain masts that are included in the v2 model. Oh, and winglets too! Even with a much higher poly count, better LOD modeling enables the 737-300v2 to double the framerate performance of the original model. Far better and more detailed to the original textures, and the fuselage and tail are the same scale now. You cannot however, use the v2 model with textures made for the original model. The v2 model has compressing landing gear, a feature even the aia 737NG's don't have. In addition the v2 model also has animated thrust reversers and XML coded flaps so you'll see it using flaps for takeoff, not just when it's landing. One of the obstacles with building and painting FS models is dealing with the limitations of the FS light and shadow engine. You can paint on highlights and shadows which look great on the texture, and may even look fine in FS screenshots, but in motion they become oddly frozen in place. If you're subtle, you can add shadows and highlights that don't call too much attention to themselves, but one of the areas that is very difficult to deal with is with engine fans. In reality engine fans tend to have a shadow from the nacelle cast on the upper section of the fan, with the lower section being more illuminated. You can even paint the engine fan texture to emulate this. And everything looks just dandy till the engines start up and your painted on shadow starts spinning around the inside of the engine nacelle like clothes in a spin dryer. But, after doing some experiments, we've come up with a way to shadow the upper section of the fan that doesn't rely on a painted shadow. This is the "standard" 737-300 wingtip, the rear white nav light is mounted on a post extending rearward from the trailing wing. This is also very common on 737-300's. It consists of a wing mounted pod that contains the light and lens for illuminating the vertical tail at night. If a 737-300 doesn't have this pod on the wingtip, it will NOT have an illuminated tail logo at night. Not very common yet, but this aftermarket blended winglet is showing up on more 737-300's every year. 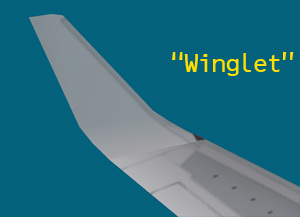 This winglet is slightly less tall than the 737NG winglet, being only about 7 ft tall instead of 8 ft.
From any distance, it's almost impossible to discern whether you're seeing a normal wing or one with the logo light pod on it, and we could have easily just modeled one or the other. But since a great many 737-300's don't have a tail logo light we decided to model both versions just to keep painters from being confused.